More about eBooks . 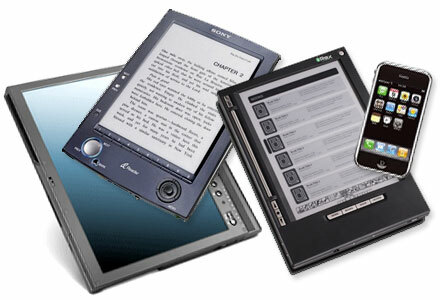 . .
An eBook is an electronic book. It is a book in digital format and is no different from a print book that can be purchased at a bookstore or checked out from a library. They are formatted to be readable on computers, eBook readers, tablets, and other devices. Since eBooks are published books, students and instructors should not be concerned that they are less reliable sources of information than print books. Our library has a large collection of eBooks to meet the needs of our students who are not on campus for extended periods of time. the books are accessible through our catalog and GALILEO, and broaden our collection beyond the physical space constraints of our libraries. Most eBooks provide additional features such as full-text searches, which make them valuable research sources. Using your iPad for EBSCOhost eBooks requires downloading a free app called Bluefire Reader through iTunes. But you have to validate Bluefire by creating a free account at Adobe.com to make it work. Go to Adobe’s website and create a free account. You can do it with your email and set whatever password you like. Give it some time to go through. Then, validate the Bluefire reader with your email and Adobe password and happily start checking out EBSCOhost eBooks on your iPad. 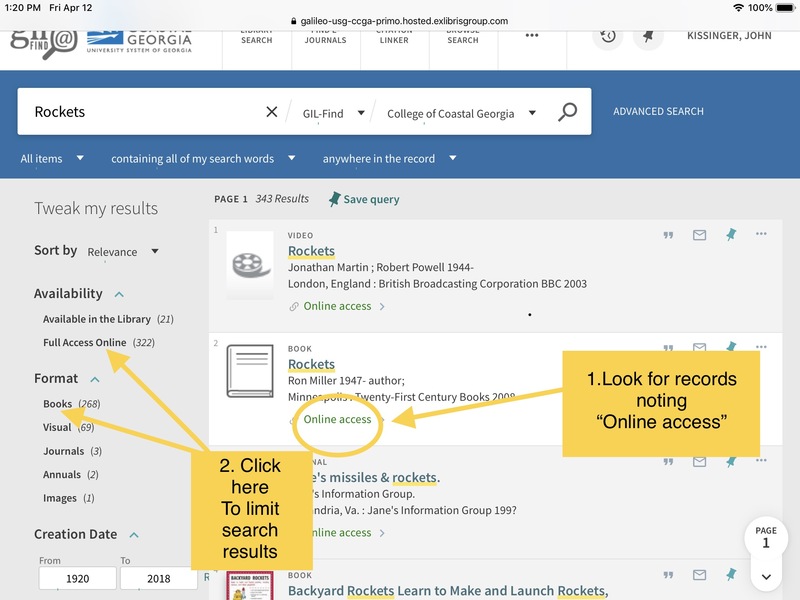 Be sure you set up an account with EBSCOhost eBooks. It's easy to do if you are on campus or else make sure you log-on to GALILEO at home using the GALILEO password. R2 Digital Library is an eBook platform for health science-related collections. Coastal College libraries provide access to the collections as a service to students, faculty, and staff. 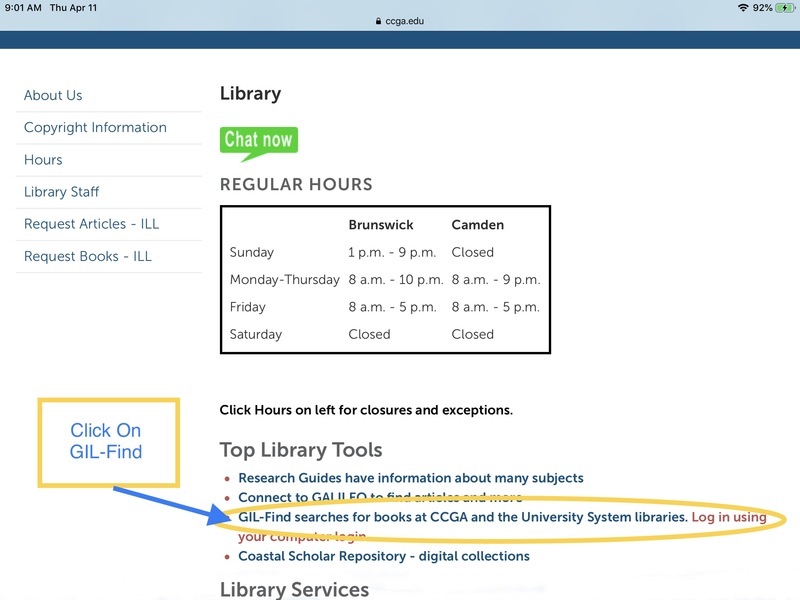 Access R2 Digital Library on campus with any web-enabled device. Access it off campus through D2L. Our libraries provide access to tens of thousands of eBooks through a variety of sources. Many of them may be downloaded to your laptop computer or a variety of eReaders and tablets (Nook, iPad, iPhone, etc.). eBooks are available 24/7 for reading and check-out and take up a lot less space in your bag. They also have loads of cool features for searching and citing. 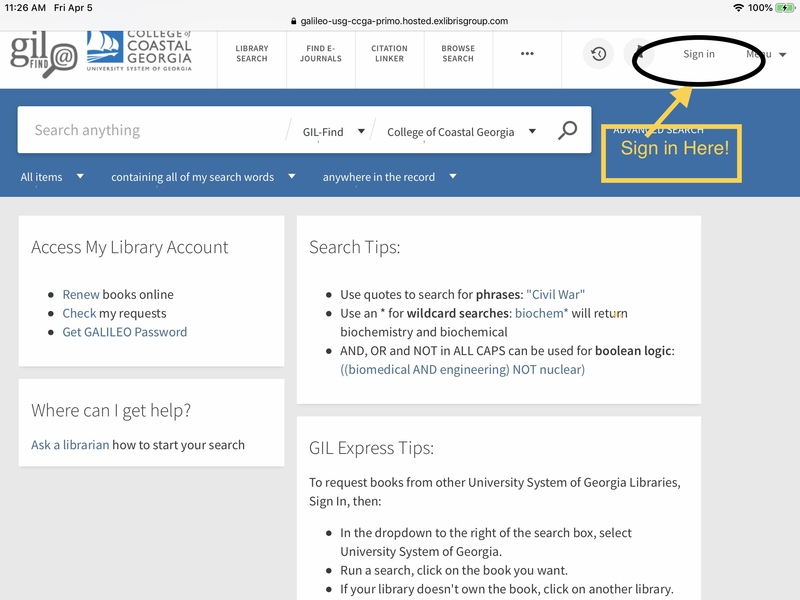 Here are some of the collections of eBooks provided by your Coastal Georgia libraries through GALILEO and the GIL-Find catalog of books. GALILEO has an entire category of databases devoted to books, eBooks, and book reviews. Book Collection: Nonfiction from EBSCO Publishing, contains abstracts and searchable full text for more than 4,000 popular nonfiction books for youth on core subject areas, as well as information on careers, health, sports, adventure, technology, life skills, and more. E-Books Index (FirstSearch) includes records for more than 675,000 eBooks. Includes free resources that are available in the public domain from education, government, and commercial Web sites. eBooks on EBSCOhost provides access to reference books, scholarly monographs, publications of many university presses, and consumer books that have been converted into digital format. 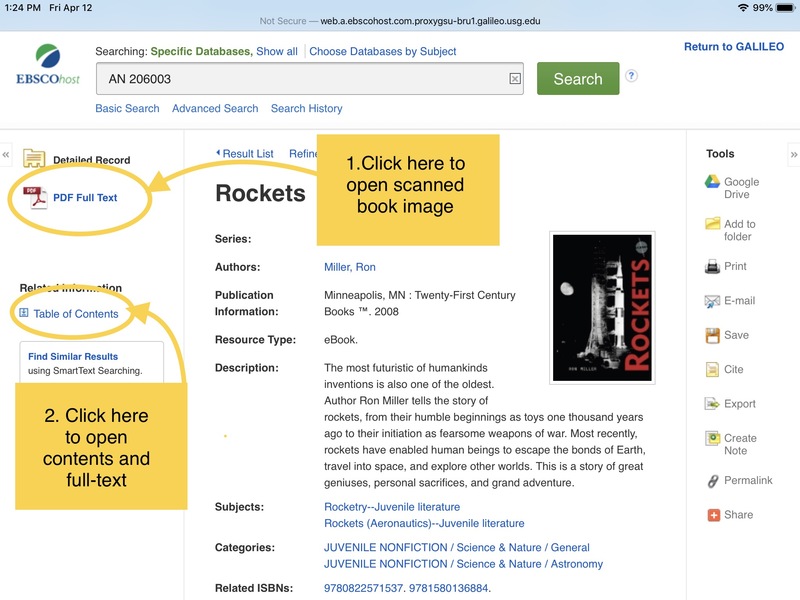 It is possible to perform full-text searches of a single eBook, search thousands of volumes simultaneously, browse topic categories, or read eBooks directly online. Most of the eBooks collection is available for checkout and download to your computer or eReader. Georgia Historic Books, from the Digital Library of Georgia, contains full-text, fully searchable books related to Georgia's history and culture. Most are from the 19th to early 20th century and focus on Georgia history, biography, and literature. Georgia History Ebooks (University of Georgia Press) includes early and seminal works on Georgia's history and culture, many published in the 1950s and 1960s that have long been out of print. Users also have the option of ordering print copies of these titles from the University of Georgia Press. 1. 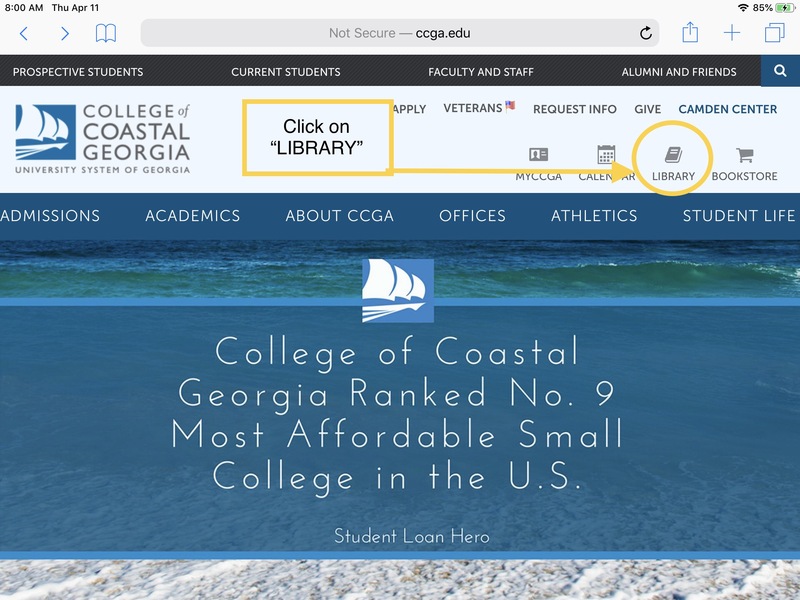 From www.CCGA.edu, Click on "Library". 3. Go To CCGA GIL-Find Catalog of Books. 4. 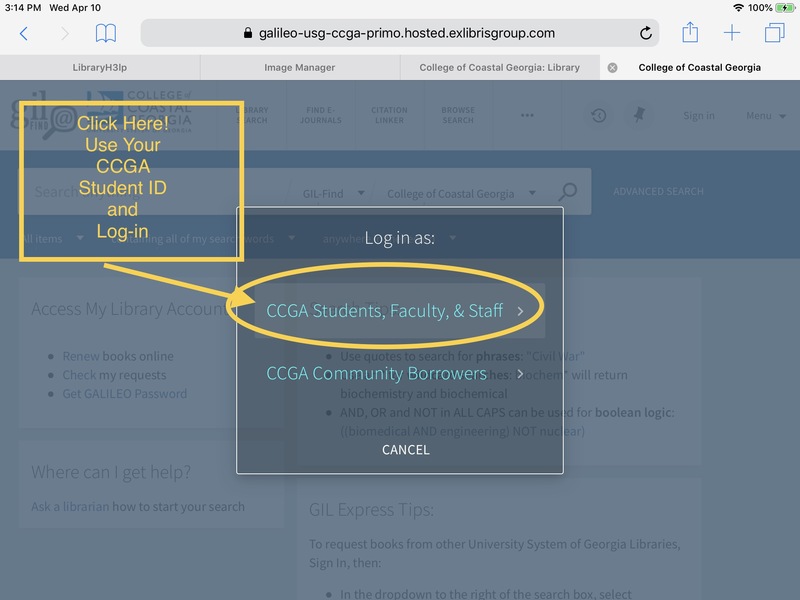 Click here and use your CCGA Student ID and Password to Log-In. 5. 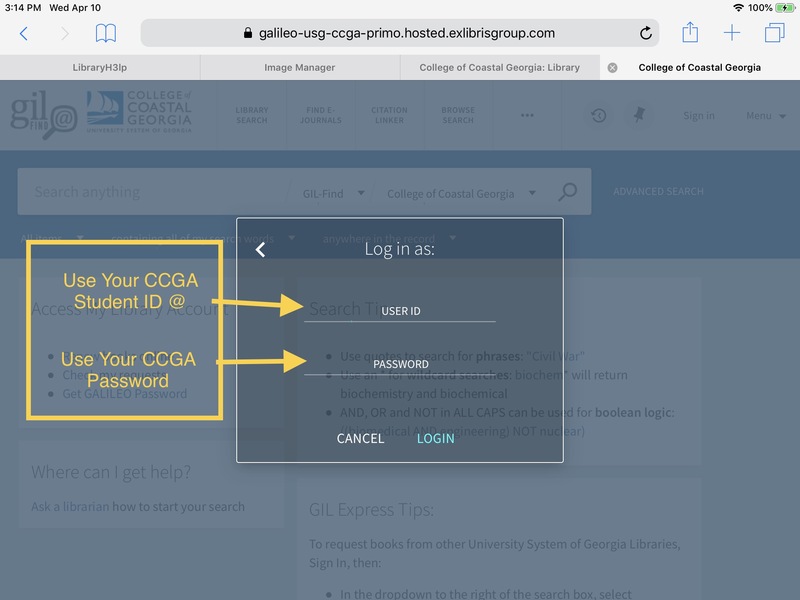 Log-In with CCGA User Name and Passsword. 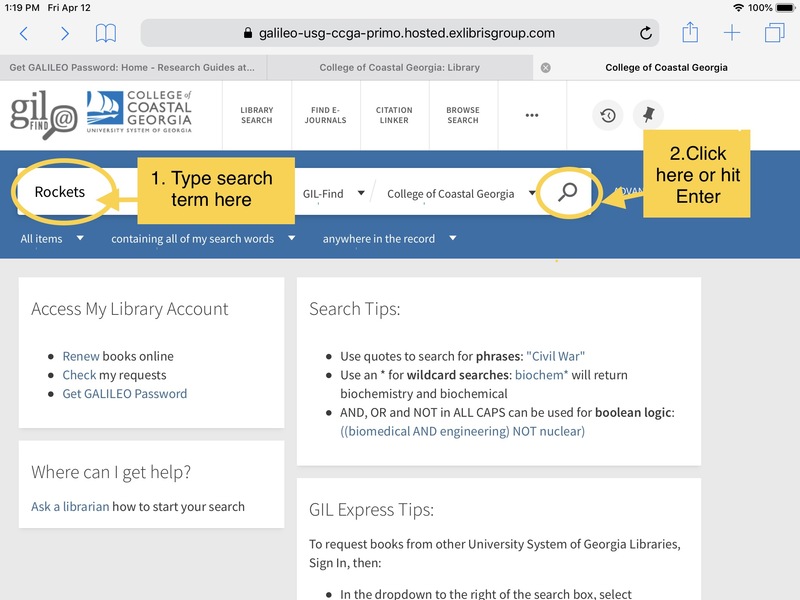 You may search the catalog without logging-in but you will not be able to view E-books off campus. 8. Click on blue hyperlink to open eBook. 7. Click on records denoting “online access” . Use “Tweak my results” to limit search results. 9. Click on “PDF” for scanned image of book or “contents” for text only.